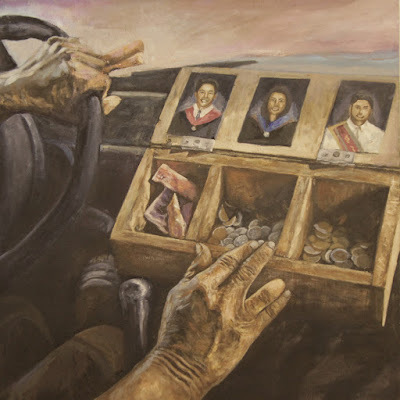 An oil painting called “Jeeploma”, depicting a jeepney driver’s pride as a hard-working father, bagged the grand prize of the 32nd Visual Arts Competition (VAC 32) of Directories Philippines Corporation and the Philippine Long Distance Telephone Company. Jayvee Valencia of Bulacan State University won second prize for his entry, “Ngiti”, while Kenneth Leo Pamlas from Tarlac State University won third prize for “Bayanihan Sa Bayan ni Juan”, an acrylic painting showing a known Filipino custom bayanihan. Aside from the VAC 32 trophy and cash prize, the Fine Arts schools of the top three winners also received cash donations and replicas of the VAC trophy that was designed by National Artist Napoleon V. Abueva in 1990. Louis Rafael Espinosa from the University of Santo Tomas won the VAC 32 People’s Choice Award with his entry “Kulturang Dalisay.” The winning entries will grace the covers of the 2018-19 White and Yellow Pages PLDT directories. “Jeeploma”—a play on the words, “jeep” and “diploma”—highlights a jeepney coin box with graduation pictures of the driver’s three children and coarsely textured coins and peso bills, along with the driver’s work-worn hands, to convey the sense that every centavo had been hard-earned and well-spent. The photograph Taladtad refers to was originally posted by Justin Linatoc in November 2012, and the winning artist acknowledges that it had been one of his sources of inspiration. More than 70 art works from fine arts students from all over the Philippines with different interpretations of the theme were submitted for the competition. Thirty entries were singled out as finalists and were exhibited at the Little Theater Lobby at the Cultural Center of the Philippines from March 13 to 20, 2018. Entries were judged according to visual composition, originality, adherence to theme and suitability as cover. The awarding ceremonies were held Tuesday, March 20, 2018 at the CCP Main Lobby. The panel of judges was composed of Chris Millado, Vice President and Artistic Director at the Cultural Center of the Philippines; Don Djerassi L. Dalmacio, Awardee of 2009 Cultural Center of the Philippines Thirteen Artists; Ruben Fortunato M. de Jesus, award-winning illustrator of children’s books, and founding member of the Illustrador ng Kabataan (Ang InK); Marabini S. Williamson, seasoned advertising and publishing expert, formerly of McCann-Erickson Phils; and Wesley Valenzuela, 1995-1996 DPC-PLDT VAC Grand Prize Winner. VAC 32 is an annual arts competition organized by DPC and PLDT for student artists in the Philippines. The competition has explored various art forms using different media over the past three decades.